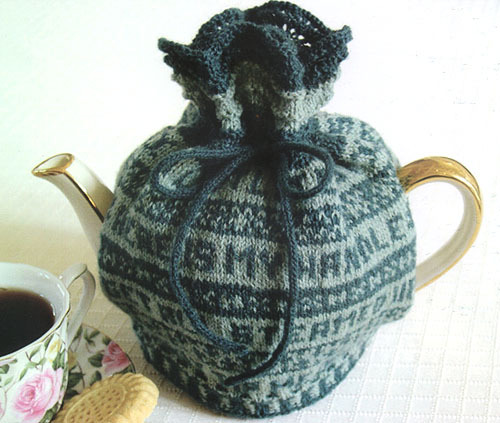 This unique Fair Isle Tea Cozy will keep your teapot stylishly warm and is knit using Jamieson's Shetland 2-ply Spindrift 100% wool yarn. Designed by June Dickinson, it has the "Teapot Song" in letters on the sides (ie. I'm a little teapot, short and stout here is my handle...) Yarn kits that also include the pattern are detailed below. If you would like to order the kit with alternative colours, please specify these in the comment field of your order form. The pattern includes charts for the 8 lines of lettering that appears on the side. The full color pattern with charts is included with the kit at a discounted price. Purchased alone the Tea Cozy pattern is $6.95 CDN ($5.95 US).